On October 4, The Alumni Society hosted its first event with new partner Nike Inc. at the athletic wear company’s world headquarters in Beaverton, Oregon. Attendees convened in Nike’s Tiger Woods Center for an intimate, one-of-a-kind networking experience. 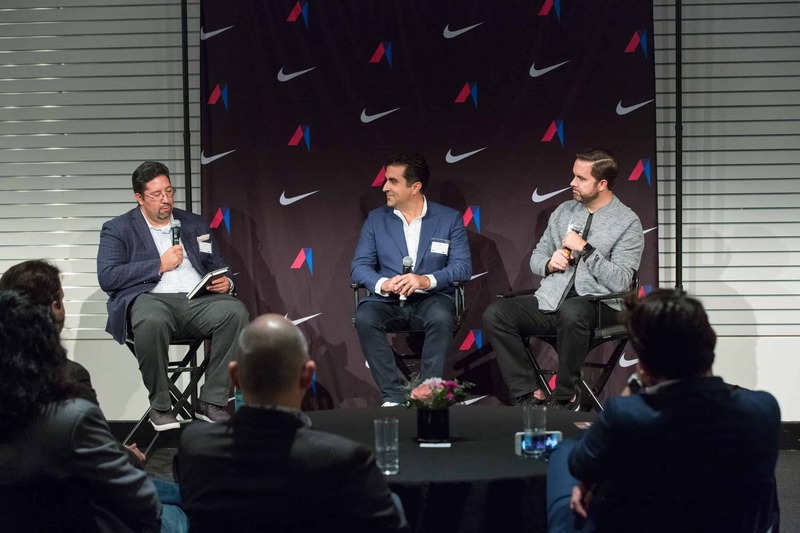 Society Connect @ Nike featured a fireside chat with two inspiring leaders: Jorge Casimiro, Nike’s vice president of global community impact, president of the Nike Foundation, and Class of 2018 member ; and Pedro A. Guerrero, CEO and cofounder of The Alumni Society. Francisco Estrada, senior talent sourcer at Nike and member of The Alumni Society, led the discussion and encouraged the audience to ask their own questions. On the topic of diversity and inclusion, Estrada asked both leaders how Latino leaders and executives can find their voice and represent their diverse community. On the theme of authenticity, Casimiro shared that it wasn’t until he got to college that he really began thinking of how to articulate who he was. He grew up in Cuban neighborhoods or Latino neighborhoods and had never had to put his identity into words. “I am facing my Latino past, if you will, because of the color of my skin, and the lack of an accent sometimes makes it easier to blend in and makes you safer in some environments,” Casimiro said, adding that it was a big part of him being able to break into corporate America. Mentorship and sponsorship is an ongoing and always relevant issue. As Estrada phrased it, how do you send the elevator down to bring others up? For Guerrero, advisory and peer groups and mentorships have always been tremendously helpful for his personal development and advancement. “I like to think of myself as a mentorship hoarder, because I seek out a lot of opinions and advice,” he said. So his main recommendation was to find a peer group, no matter what career stage. Casimiro weighed in on the importance and effectiveness of sponsorship, which is a more genuine experience for him. He told the audience about his trip to Atlanta to celebrate the retirement of his sponsor, who was the president of the foundation that provided Casimiro with a scholarship from high school to college. “Being there at the celebration made me realize that what I got the most from him wasn’t mentorship, per se, but he provided stability and consistency at a time in my life where I didn’t have that,” he said. The final portion of the discussion centered on audience questions, particularly on how leaders can tap into board directorship opportunities. He added that Latinos have to take opportunities as much as possible. Casimiro currently sits on two nonprofit boards in Portland, one of which is the OHSU Foundation. As a member of the large board, he is “always making noise” about diversifying. He received a call when he was about to board a plan to DC, and they asked if he would chair their nominating and governance committee. Photos from the event can be found on The Alumni Society Facebook page. The next Alumni Society events with Nike are scheduled for 2019.